In the bitter cold wilderness of Avantia’s mountain peaks, every moment is a struggle to stay alive. But the mountains are not as barren as they look: they hide a mighty and hideous creature. As frozen winds tear him off his feet and lashing blizzards blind him, can Tom prove a match for Nanook the monstrous snow beast? its a excellent book for kids with imagination. My favourite part is when Tom fights the monster. 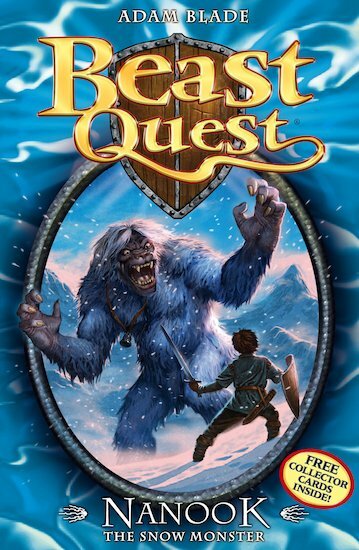 Don’t really like Beast Quest to be honest. I loved this book.I thought it was a good idea that nanook was a girl. It is like real life! Liked it, Nanook the snow monster protects the icy plains in the north of Avantia. One blow from her paw can crack a lake of solid ice! This one is also fantastic!